Out of sight and out of mind—does this describe your relationship with your septic system? If you are like most homeowners, you probably never give much thought to what happens after something goes down your drain. But if you rely on a septic system to treat and dispose of your household wastewater, what you don’t know CAN hurt you. MONEY — The number one reason for septic system upkeep is money. Failing septic systems are expensive to repair or replace, and poor maintenance is a common cause of early system failure. The minimal amount of preventative maintenance that septic systems require costs very little in comparison to repairs or replacement. Overall Health — The second, and most important, reason to maintain your system is to protect the health of your family, your community, and the environment. When septic systems fail, inadequately treated household wastewater is released into the environment. Any contact with untreated human waste can pose significant health risks, and untreated wastewater from failing septic systems can contaminate nearby wells, groundwater, and drinking water sources. Chemicals improperly released through a septic system also can pollute local water sources and can contribute to system failures. For this reason it is important for homeowners to educate themselves about what should and should not be disposed of through a septic system. Home Investment — The third reason to maintain your septic system is to protect your investment. Failed septic systems can cause property values to decline. Sometimes real estate sales can be delayed for these properties until systems are repaired or replaced. Also, failed septic systems can contribute to the pollution of local rivers and lakes that your community uses for recreational activities. Existing Landscaping — The fourth reason to maintain your septic system is protecting your existing landscaping from damage during any replacement or repair services. 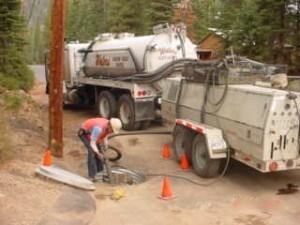 Septic system repair and replacement can often lead to invasive techniques that will harm your landscaping work, and it can become costly to repair the disrupted areas. A properly designed, installed, and maintained septic tank and drainfield system should treat wastewater in a way that minimizes the impact on groundwater, surface water, and human health. Proper maintenance includes having the tank cleaned regularly, conserving water and spreading out water usage, managing solids in wastewater, keeping potentially hazardous materials out of wastewater and protecting the drainfield.